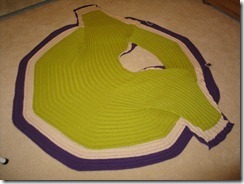 Blocking is always important in making the most of any knitted garment, but especially so when it comes to a Swirl. Swirls, by nature of their welted structure, tend to pull up, each welt snuggling up against the welts immediately above and below. 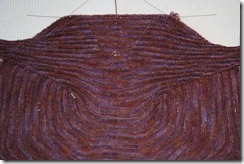 Wet blocking opens up the welts, enhancing the drape and sculptural qualities that are central to the design of a Swirl. 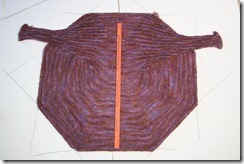 Once you’ve finished knitting your Swirl and have woven in any ends that will not be used as part of the finished trim, you’re ready to block your Swirl. 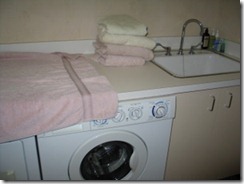 Begin by preparing an area that is: 1) large enough to accommodate the expanse of a Swirl and allow room for you to maneuver around it, 2) on a surface that will accept pins (beach towels spread over carpeting works well) and 3) in a location where the garment can stay long enough to dry completely. Place a supply of T-pins, a yard stick and blocking wires (optional but extremely helpful) nearby. 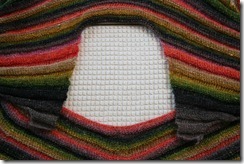 It is helpful at this point to mark the center of the neck edge and the center of the collar edge. 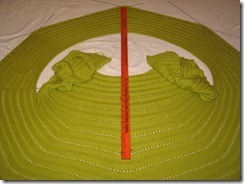 These markers will aid you in aligning the Swirl during blocking and again later when you sew the seam of your Swirl. An easy way to do this is to fold your Swirl in half down the center of the back. (You thought Swirls were oddly shaped before? Take look at this image!) 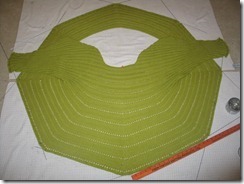 Place two markers on the fold, one at the neck edge and another on the inner edge of the collar. Now you’re ready to wash your Swirl. 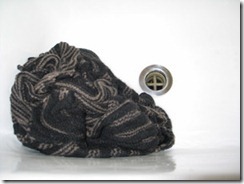 Spread a large towel out on a counter near your sink and place a stack of towels nearby. 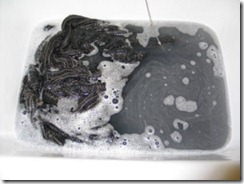 Fill the sink with enough lukewarm water and mild soap to allow you to completely submerge your Swirl. Toss it in. Let your Swirl soak for a few minutes and then gently swish it around in the water to encourage any excess dye to release. 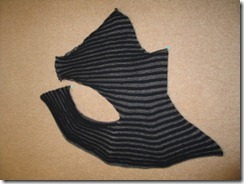 With “right side” up, carefully spread out the Swirl, folding the sleeves up so that they rest in two piles on either side of the neck edge. 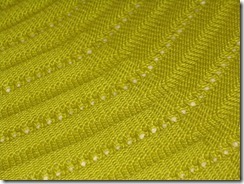 If using blocking wires (optional but highly recommended), insert a blocking wire from bottom to top at a point on the first row of the second welt and in line with the decrease point above. Thread the wire in and out along the row across the length of one section, ending with the wire exiting downward directly below the next decrease point. Repeat this process at the remaining 7 sections. in oval silhouettes, the top and bottom edges are in line with one another and perpendicular to the right and left side edges. 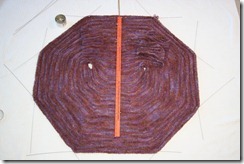 I have found it useful when working on alignment to place a yardstick at center back, aligning it between the decrease points at the center back of a circle silhouette, or along columns of stitches at center back of oval silhouettes, and placing T-pins at several points at the both sides of the yardstick to create a channel in which I can slide the yardstick up to the top of the collar and down to the edge of the lower back. A similar approach can be used to check horizontal alignment from side to side. 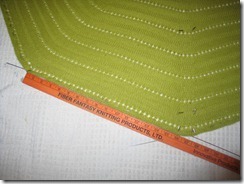 Pin each section so that its edge is straight, measuring as you go to ensure that sections with the same number of stitches are all of the same length. There will be a short section at each point that has no wire edge; it should be blocked with a straight edge that repeats the angle of the rows between decrease points immediately above and should all be of the same length. Once the outer circle is aligned and pinned in place, being careful not to stretch, gently unfold the sleeves and bodice. in off-center silhouettes, it often does. 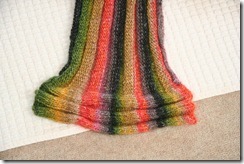 The goal in blocking the sleeves is to avoid stretching them lengthwise. The sleeves (reminding you again) should not be pinned, but arranged so that the stitches are relaxed, raised welts touch one another, cuff edges kept as compact as possible. 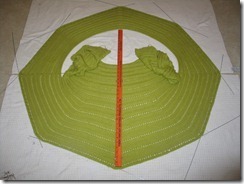 The sleeves will be shorter than the finished measurements indicate. When completely dry, remove all pins and wires. 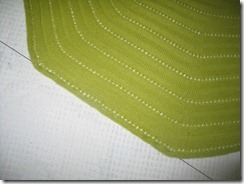 You’re ready to seam!